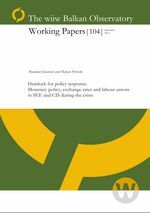 The objective of this paper is to assess how the level of unionisation and the rigidity of the exchange rate affects wages and monetary policy in South-East Europe and the Commonwealth of Independent States, with a particular focus on the recent economic crisis. Towards that end, a New Keynesian model with price and wage rigidities is used. Results suggest that fixed exchange rate and strong trade unions seem to constrain monetary policy in these countries, because monetary policy responded counter-cyclically during the crisis only in countries with weak trade unions and countries with flexbible exchange rate. Also, findings point out that trade unions may be more effective for controlling inflation in these countries than the monetary authorities.